Musings on race, ethnicity, and identity - ZineWiki - the history and culture of zines, independent media and the small press. 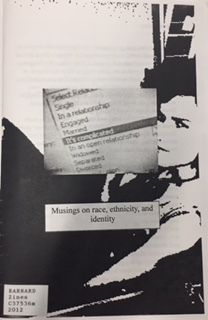 Musings on race, ethnicity, and identity is a zine made by Rachel Casiano Hernandez in July 2012. This zine is a combination of writing, memes and other digital images about navigating being a lesbian, American, Latina, and upper-middle class and the intersections of all those identities. Hernandez includes a recommended reading page at the end of her zine. This page was last modified on 3 July 2018, at 09:22.